Sandy Duncan has said on the official YoYoGames Glog that the Help desk on YoYoGames has been answering 95% of submitted help tickets within 24 hours, which has improved drastically in the last two weeks. Mr. Duncan also said that using Softwrap for DRM in Game Maker 7 is “high on [his] list of ‘things we should have done differently'” but its not going to change any time soon. This brings up past rumors that Game Maker 8 (or future versions of 7) might not include Softwrap or any DRM at all. InstantPlay tab of the decompiler. 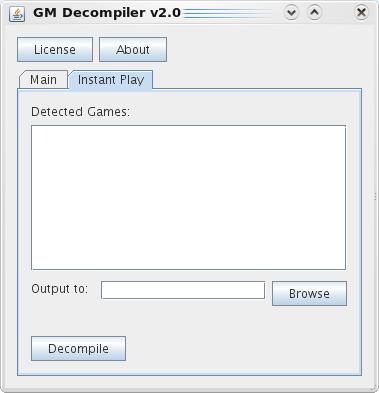 This morning an update to the GM Decompiler was released, this time with the ability to decompile InstantPlay games and extract GM7 extensions from games. The update also defeats some methods devised for protecting games from the old decompiler (typically using a hex editor to tamper with the PE). InstantPlay decompiling automatically detects games you have used via InstantPlay, which are stored in a folder under My Documents. Users are presented a list of games detected and the rest is automatic. Version two of the infamous decompiler is by the same author (Clam), and includes the same vengeful message about GMK encryption (which was designed to defeat third-party projects). GMNews and Scorptek do not endorse copyright infringment. This news posting is for informational purposes, and links to the decompiler will be deleted. There has been a lot of interest regarding how Game Maker creates and runs executables, and some possible alternatives, as evidenced by numerous topics regarding this issue posted in the GMC. In addition to a few knowledgeable and informative posts, there has been a lot of speculation and noise. A large part of the confusion is a basic misunderstanding of the processes that happen between the pressing of the “Publish game” button and the start of the created game. In this piece, I will attempt to explain GM’s handling of executables in as much of a non-technical, understandable fashion as possible. In addition, I will list the pros and cons of compiling your game before runtime, or translating it automatically into an entirely different language. A Game Maker executable currently consists of two items – your data, or what is actually interpreted and executed, and the runner (written in Delphi), which carries out the actual execution. This is why an empty game still takes up around 2 MB of space – the runner executable is automatically included in every GM .exe. Without this, your games could not run. Because the game executable always contains the game data, and because the runner must know how to decrypt that data, essentially a game executable will always be a case of “here is the locked box, and I’ve hidden the key somewhere under it”. YYG could provide a new encryption, but it would only be a matter of time before someone breaks it again. So why include the data in the first place? The current method that GM employs in creating an executable version of your game is designed to ease the development process as much as possible. If you’ve ever had a syntax or other error that halted game operation, you were graced with a nice error message detailing not only what the error was, but where. In order for this process to occur, the application must have its source code available and accessible. Without the source code, GM could only tell you that an error occurred somewhere in your code. Debugging then becomes a much more intensive process. There’s a lot to say for what that means, but let’s make an easy analogy: when I want you to “jump 3 times on your left foot and 3 times on your right foot” I could just shout that to you, or we could have an appointed signal, e.g. waving, so that we don’t lose time by you listening and intepreting what I just said. The engine works in the same way – at runtime it converts the GML script (scripts are always a method to give complex computer processes a syntax meaningful to humans, but computers do not need them) into bytecode, which are series of so-called tokens (the signals) and their parameters. At runtime, it’s faster at executing bytecode than trying to read the GML syntax. But this is not the same as compilation, Smarty stresses. Compiling an application involves parsing source code into a machine-readable bytecode, so that it is accessible at a lower level, and thus, slightly faster. However, your machine lacks the error reporting abilities of a custom-built runner. After your source code is parsed and your game begins, the runner starts interpreting your game code. “A runner is basically a bunch of if-else statements. If it sees a particular token [instructions given by your code], it does something,” explains Yourself. A suggestion commonly put forth is to compile the entire game itself, as opposed to letting the already-compiled runner interpret your code. Your resources would be protected, and it does lead to an increase in speed, but “[you’ll] lose all the ease of use,” as Yourself explains. As mentioned above, the type of error reporting used by Game Maker would not be possible. In addition, Game Maker would have to become “a compiler itself.” This is an enormous and costly undertaking, requiring the writing of instructions that would parse every GM function into machine code. The benefit/cost ratio would be minimal. As mentioned above, the runner itself is written in Delphi. When YoYo Games announced that it was being rewritten in C++, wild speculation arose as to whether enormous speed increases would be seen, or even if GM games would now be compiled. However, both those claims have been debunked, as there is little speed advantage between Delphi and C++, and creating compiled games would not be possible if the runner was simply rewritten in C++. So why is the runner being rewritten? We’ve really done this work as a start of our program to have Game Maker apps running on other platforms….NOT to see if we can find advantages on Windows. Another alternative that has been discussed recently is to compile your code into another language’s bytecode, and run your game as an application written in that language. Among the many benefits put forth would be portability. A program that compiles to JVM bytecode could be run on any program that has the Java Virtual Machine installed. However, this is an extremely non-trivial process. As mentioned above, a specific compiler would need to be written that takes into account every single GM function, and parses it into another language’s bytecode. This is possible (along with a one-to-one translation of your code into another language), but the cost of undertaking such a project is extremely high. Despite the speculation surrounding different methods of compiling GM games, one must always remember that, as with anything, there are always trade-offs. In order to gain more speed, a game developer could program in C++ (or, according to the age-old meme at the GMC, in assembly). However, a great deal of ease-of-creation is forfeited. With C++, the drawing area must be rendered manually, as opposed to simply changing an object’s coordinates and seeing it dutifully move across the screen. The reason Game Maker exists in its current form is to allow for easy, quick game creation or prototyping. Sacrificing this ease of use makes Game Maker essentially useless, as making Game Maker games work could be as difficult as coding in C++. At that point, one would be better off simply coding in C++. Simply put, sure, it’s possible to make Game Maker run faster by compiling it before runtime, or by coding games in a format that makes the more conducive to increasing run speed. But sacrificing this ease-of-use would be pointless. If speed is enough of an issue, it may be time to learn another language. But if you want to create games in a matter of hours instead of days and weeks, Game Maker is the best option.